This morning I greeted one of my church friends at St. Francis who has cancer. He recently began chemotherapy. Today we said good morning, but I did not recognize him immediately until he passed by because either is hair had fallen out or he had his head shaved. I exclaimed his name, when I recognized him. He had just walked a long way from the parking lot into the church in order to faithfully worship with us, as is his habit. Part way through Mass, he got up with two people, one on each arm to go out. I was serving as an usher this day and I recognized the problem and started up to help, but seeing two people already helping, I sat back down. He collapsed to the floor, the people helping him not able to hold him up. I rushed across the room, but he was already surrounded with others in his seating area helping him. Silently I prayed, with tears, and assisted a woman who had called 911 in flagging down the fire trucks who arrived before the ambulance to help. The ambulance arrived and he was put on a stretcher while conscious and rolled out of the sanctuary with applause by the congregation. Later, after church, several of us held hands and prayed for him, and recited the “Our Father” at the end. As I write, I don’t know how he is doing, but as I am doing my Examen this night a thought occurred to me: Jesus dies every day! What do you mean, John, that Jesus dies every day? He died only once, on the cross, for all of mankind and Jesus said, “It is finished.” Jesus also lives in each of us and the image of God lives in every man. We can find God’s presence in everything that exists, in every sparrow which falls to the ground which God knows. Why? Because He lives, and in Him we live and move and have our being. God is in all things. By now you may have figured I am not going to thump on the Bible for scripture references concerning what I am writing, and what I am imagining. Let’s just think about it, and if I imagine something wrong, I stand corrected. Thus, I imagine that God who lives in us also dies with us when we die. When we are in pain, so Jesus is in pain. He knows. We are supposed to die daily to ourselves, putting away the old man of sin. Why would a little of God not die when we die to, to be later resurrected? Jesus promised to draw all men unto himself. Even if Jesus does not do that in our life time in this physical body, what prevents Him from drawing us to Himself at our (our and Jesus’) death? He could just show us in brilliant light, in a love filled way, what with God is really like and let us choose life. If you want to live forever as He draws us to the loving light and unto Himself, now is the time to believe. Don’t count on the unknown future. I will overlook the objections that Jesus cannot save us immediately because we have to pay for our sins, or be purified in purgatory. I wonder if Jesus does not in a way die again with us, experiencing our pain, our suffering, His hands held out in compassion and love for those who live in Him and Him in us, and if we fall, to raise us up again? What about my friend who collapsed in church today? He has lived a good life already. Every day is a gift to him from God who gave him life and who lives in him. Maybe God will answer his and our prayers and miraculously heal him, or maybe not. Either way, God knows how to die, every day. He knows how to raise from the dead and how to take care of those whom He loves. In the interim, if there is an interim, let us trust in Him, as does my friend. Somewhere in the news a week or so ago I glimpsed at a report that some DACA Dreamers had come to the U.S. Congress and attempted to wash the feet of congressmen outside the congressional offices. A week or so went by and a quiet urging came to my mind that this is a wonderful idea for the whole State of Alabama, a State that is viewed by some as solid red, and less than progressive in social causes. What can be done? I brought the idea to my church, the Roman Catholic Church in Tuscaloosa, and copied several people who work with the Hispanic communities and other immigrants on the idea of having a footwashing event for and by the Dreamers in our midst. 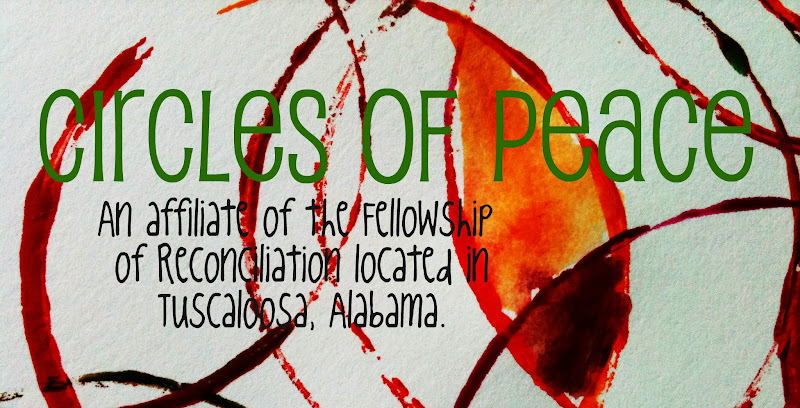 I emailed to a contact in the Mobile Archdiocese and a contact in the Birmingham Archdiocese who work with the Dreamers and copied the Fellowship of Reconciliation which I am a member of and which has been involved in non-violent social causes such as the Civil Rights Movement for decades. I am merely offering my voice and the idea that came to me for a non-violent footwashing event or events organized and conducted by what we in the United States call Dreamers. As a little background, we who are Christians will soon be celebrating Easter and just before Easter, before the Passover, some unusual to some events are recorded to have taken place, like Footwashing. Footwashing has an ancient tradition and is viewed by some as a Sacrament. A type of this tradition is observed by Roman Catholics on Holy Thursday. Mary Magdalene is said to have said to have done it with tears of love and remorse. Mary the sister of Martha and Lazarus is said to have done it too. Both women did it to Jesus and wiped His feet with their hair. Jesus washed His disciples’ feet too. Jesus tells his disciples, if we consider ourselves to be disciples, to do it to, to one another. Is this real? Is it figurative? Is it both? Footwashing does not have to be done in church, it can be done anywhere. It can be done in our imagination too, which may be about as far as this idea goes at this time. My vision, my dream for Alabama and I wish I could dream the whole world, is that we would want to wash each other’s feet all around the world, in North and South Korea, in Syria, In Yemen, Iran, and Qatar, Ethiopia, and everywhere. I know this is all and grad idea that we should love one another and love our enemies, just like that, but forgive me, please, I am just Dreaming. As for Alabama, I dream that this idea, this dream, would be seed for greater action beyond out State, and beyond politics and helpful to all immigrants. I dream the Dreamers would take up this cause and offer to wash the feet of those in power, speaking to the powers, and symbolically telling those powers, be they congress people, police, religious powers, educational powers, all powers, that we are here to serve you, that we love the United States, and all nations for that matter. Let us serve you, pay our taxes, contribute to our society, support our families off the welfare system. We want to work. We want to love one another. We believe America will be great again when America can love again. Today is Resurrection Sunday, Easter Sunday. Our St. Ignatius reflections today focused on John 20 and the resurrection event. My personal focus today was on all of this in relationship to Mary Magdalene. What I write is mainly out of my imagination. I think when one dies it would be good to have at least one person who really loves you, more would be better. I imagine Mary Magdalene loved Jesus the most, perhaps even more than Jesus’ mother, Mary, or even more than the Apostle John. It was a different kind of love for each of these people. Mary Magdalene is said to be a sinner, but we are all sinners and need to know how big of sinners we are, just like Mary Magdalene. Some say she was a prostitute, but there is no evidence of that being true that I know of. There are other ways to sin. Mary was rich. She gave lots of money to support Jesus. She loved Jesus. Jesus was broke. All He had worked for all his life physically was gone. He had some good years too, and had money at times in his life when some wealthy people around Capernaum would hire Him. One time Mary hired to make a chest of drawers for her clothing. She had some nice clothes. Some people said she should have worn more of them sometimes, but she wanted to look good to the men and be compelling to them. She was about 30 years old, a beautiful woman with long red hair. Oh, the chest Jesus built had dovetail drawer joints, hand cut ones too. The drawers opened smoothly on wood runners one would put a little wax on occasionally to make them slide easily. The air would whoosh out just right as one closed the drawers. Jesus always remembered making that chest for Mary. She paid him well and gave him a hug when delivered it to her home. Jesus loved Mary. After Jesus died, Mary cried all night. It was the Sabbath and she knew she should be sleeping and resting, but she just couldn’t do it. All she had ever believed in Jesus and other “religious” stuff and how He said one should overcome the evil and sin she had done, and overcoming evil with good, which to her was the Goodness and presence of Jesus in her life had been taken away. Most everybody knows about these things; her story has been told and retold for thousands of years. I am just filling in some details of how it could have been, how I imagine it and how Mary ran with long hair flowing, and danced as she skipped along the Judean hills to go to tell Peter. Mary was the very first Evangelist, telling this good and wonderful news. A woman was not supposed to be a witness back then, but she did it anyway because Jesus, whom she loved, told her to do it. “Go and tell” Jesus said.